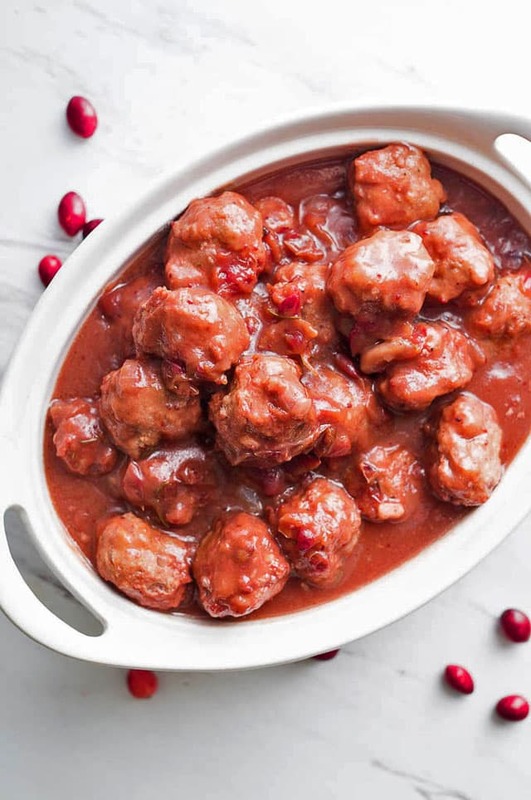 Cranberry Balsamic Meatballs are the perfect appetizer for holiday entertaining. Pop one into your mouth and taste an explosion of cranberry, rosemary, and balsamic vinegar packed into one savory bite. Making balsamic meatballs in an Instapot is quick and easy with this pressure cooker meatballs recipe. Hi there, it’s Jessie from Kitschen Cat! We made it to December and holiday preparations are in full swing everywhere you look. From now until New Years I’ll be eating my fair share of all the holiday foods! Cranberry apple sauce, nuts of all sorts, appetizers galore, sugar cookies, hot cocoa, wassail, and any other festive food that is set in front of me. For those of you who are anticipating upcoming holiday parties, I know that sometimes it can be stressful to decide what to bring. There are many factors that play into what you could choose to make, but for me at least, one of the biggest considerations is the amount of time I have available! These meatballs are a great option for those of you who need a quick and easy crowd favorite. An Instant Pot is one of the most popular brands of electric pressure cookers. 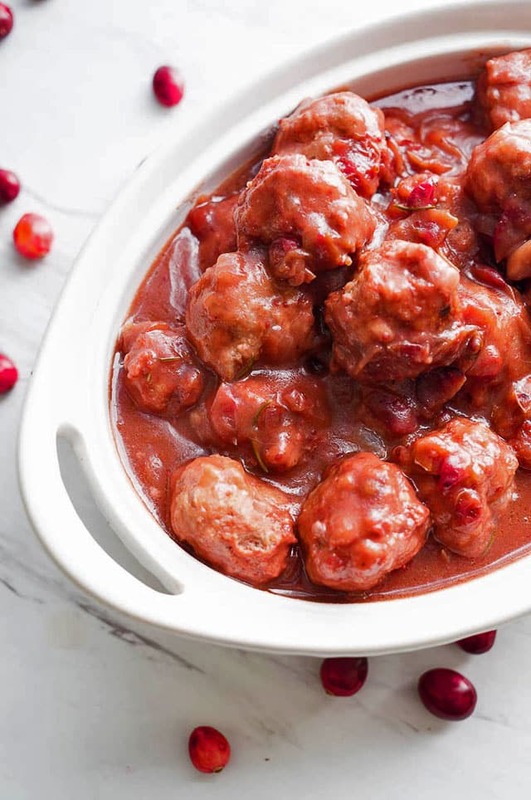 They are easy to use and your Instant Pot can help you create these delicious Cranberry Balsamic Meatballs! #1. No mess! 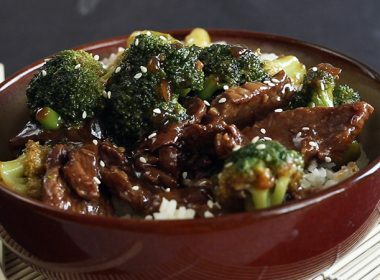 Everything is contained in one pot and you don’t have to deal with scraping burnt bits off a baking sheet or maneuvering your heavy crockpot into the sink to scrub it down. #2. Pressure cooked meatballs come out so tender! If you’re looking to preserve moisture and make the juiciest, most flavor packed meatballs, the electric pressure cooker is the way to go. #3. Fast cook time! You can make the cranberry balsamic glaze in five minutes in the pressure cooker and then pop in the formed meatballs and bring to high pressure for another five minutes. Including all prep and cook time, these cranberry balsamic meatballs can be ready to eat in less than 30 minutes! The tangy cranberries coupled with the fruity balsamic vinegar and the earthy rosemary creates the perfect glaze for these ground turkey and pork sausage meatballs. I think this will be a sure hit at your holiday parties! Combine all ingredients for cranberry glaze in pressure cooker. Stir and set to high pressure for 5 minutes. While glaze is cooking, use your hands or a large sturdy spoon to mix together meatball mixture. Form into 1 inch meatballs and set aside. When cranberry glaze is finished, do a quick release and add meatballs into the pot. Pressure cook meatballs in glaze for 5 minutes on high pressure. When finished, do a quick release and serve! **If you would like your glaze thicker, remove meatballs from liquid and whisk in 2 tablespoons of cornstarch before adding meatballs back in. 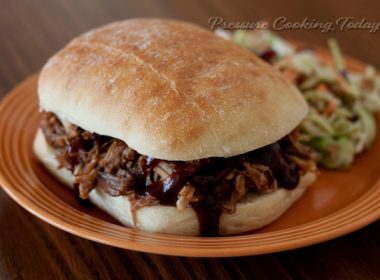 Visit Kitschen Cat for more great pressure cooking recipes. I just received your cookbook and am thrilled with it. 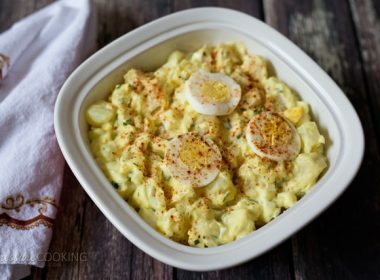 I have tried many of your recipes and I love them all. Thanks Judy! Have so much fun trying the recipes. I’d love to see pictures! 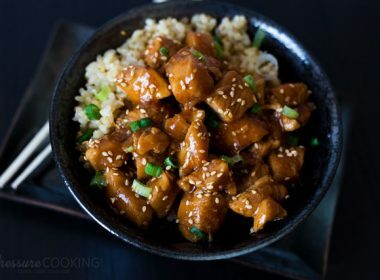 Made this recipe today and it was beyond delicious! Thank you! Hello – i just bought a pressure cooker and am delighted to try new recipes..and this one sounds like something my kids would gobble up. Is there any substitute for cranberries? Are you referring to those in cans? I made these a week ago for a party and they were so good that I’m making them again! The only thing I’d like help improving this time around is the way the meatballs stick together. Any advice on how to keep them from blobbing up? I’m not up to making my own meatballs but would love to try this recipe with frozen meatballs (fully cooked). Do you have any suggestions on when I should put them in and timing? So the pork sausage doesn’t leave a greasy residue while cooking? Barbara, thanks for another delicious sounding recipe. I am going to try I when I have a house full of guests for the holidays next week. Everything of yours I have made has turned out great. At your insistence and arm twisting (you must be exhausted – it was a hard sell – NOT), I bought the InstaPot and love it. Keep us inspired! Happy holidays to you in Texas from a native Texan and longing to be back home! 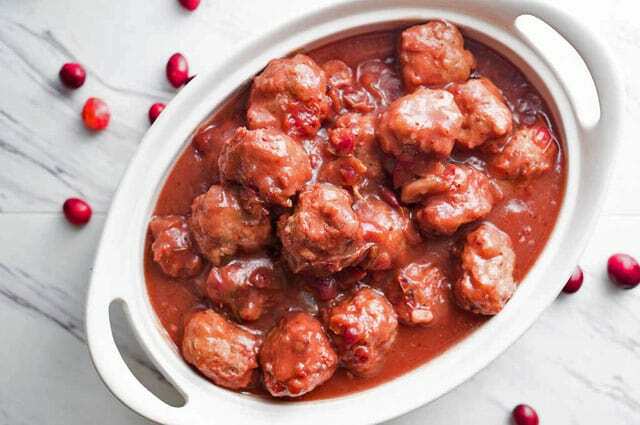 These cranberry balsamic meatballs sound delicious. How long would you cook in an electric pressure cooker. 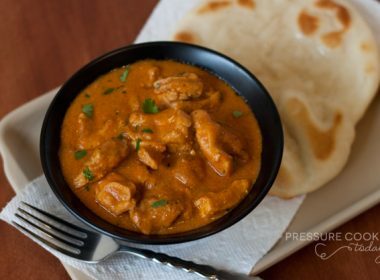 Is there a standard calculations to switch from stove to electric pressure cooker? Hi Candy – the recipe is written for the electric pressure cooker. 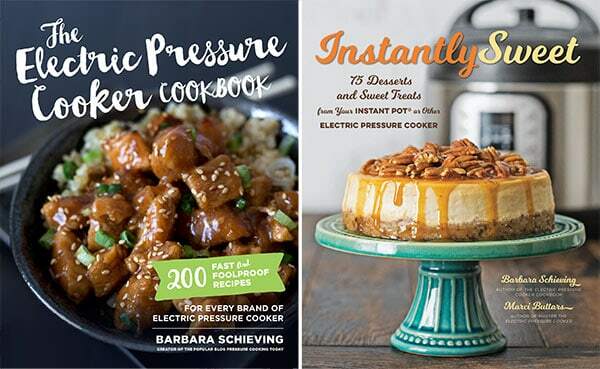 Which pressure cooker do you have? 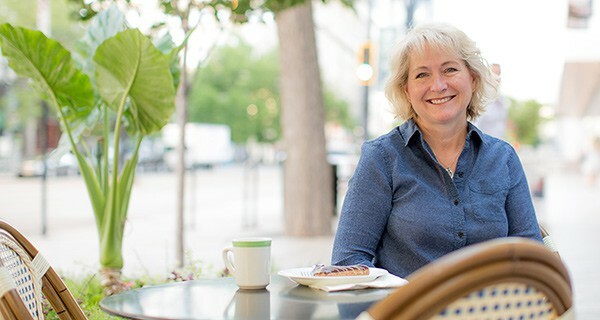 Hi Barbara. Thanks for replying. I have 2, a Cuisinart and a Nesco. Haven’t used it a lot but do love how easy it is to hard boil eggs. Thanks for the great site and look forward to trying the meatballs. Do you have any great recipes for 2 people that we could try in our motorhome?